Anyone can grow house plants, say the authors of a news book. Gillian Vine reports. 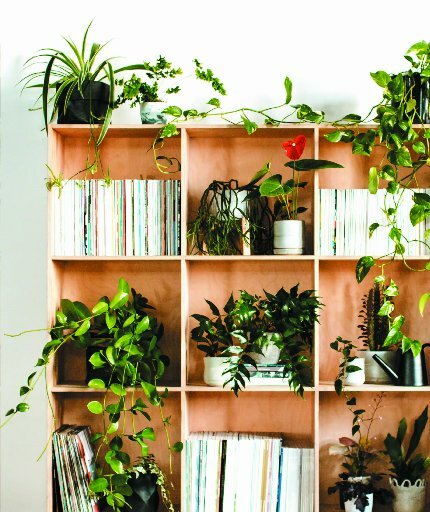 In Leaf Supply, Australians Lauren Camilleri and Sophia Kaplan say it's lack of confidence that dissuades many people from growing plants indoors. "The idea that some people are cursed with a black thumb is nonsense," they say firmly. "Armed with the right knowledge, anyone is capable of keeping a plant alive." That knowledge begins by looking at your space, whether it is light and sunny, which suits cacti, or a semi-shaded corner, where a rubber plant would feel at home. Having bought your plant, the next step is potting it. "It's worth noting," the writers say, "that even though it's often referred to as soil, most commercially produced potting mix doesn't contain any actual soil, but rather is a mix of organic and inorganic matter, often enriched with fertiliser." 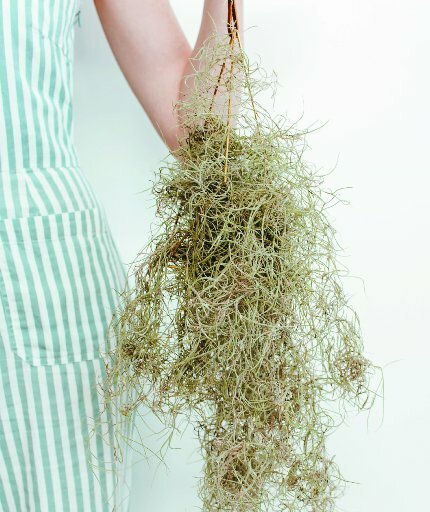 Spanish moss (Tillandsia usneoides) is an air plant, so needs no soil. If the mix includes peat moss, this adds lightness and improves water retention, so Camilleri and Kaplan advise using such a mix for plants that like moist soil, such as ferns and begonias. Rubber plant (Ficus elastica) in one of the most popular large plants for office decoration. The section on feeding indoor plants will be of particular value to the novice grower and it is cheering to the forgetful to learn that most house plants are low maintenance, so fertilising them is not always necessary. Water is another story altogether. Leaf Supply makes the vital point that killing with kindness - overwatering - is one of the biggest mistakes people make when caring for indoor plants. "One important thing to understand is that a plant's water needs are closely related to the amount of light it receives." Thus, shade-loving ferns need more water than cacti on a sunny windowsill. How do you decide if a foliage plant needs water? Poke your finger into the soil near the edge of the container and if the first 5cm is dry, watering is needed. "Gently lift your plant's foliage and flood the potting mix with tepid water until a trickle appears from the drainage hole at the bottom. Let the plant soak up the water for 30 minutes, then empty any remaining water from the saucer," is the technique recommended by Camilleri and Kaplan. They acknowledge that most of us use tap water, which may contain salt and minerals that will be detrimental over time, so they suggest putting plants outside when it rains. (I have found that will mean the rain stops the moment the plants are outside, so collecting rainwater and storing it in a clean plastic milk bottle is more effective.) Alternatively, put tap water in a bucket and leave for 24 hours for the fluoride and chlorine to dissipate. Carnivorous plants are very sensitive so rainwater or distilled water is essential for their wellbeing. The book has very useful advice about choosing the best plants for the amount of light in your home and in grouping those that like the same conditions. If you think any old pot will do, apparently it doesn't. Don't be tempted to go for a container much bigger than the current one. Surprisingly, this can stress the plant and the extra potting mix will hold water and may cause root rot. There are good sections on propagating and on common problems before individual plants are considered. The emphasis is on foliage, so common house plants like the peace lily and Hoya are pictured sans blooms. The lack of an index is rather frustrating but, apart from that, Leaf Supply is a good introduction to keeping house plants happy - and convincing the pessimists that black thumbs are a myth.